Project Details: We created this label for Richmond’s own Melitos Restaurant. 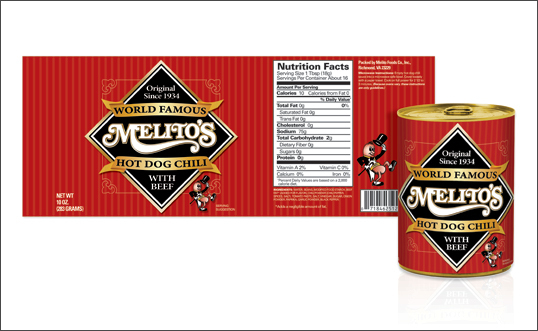 Melitos was planning on introducing their own line of canned Hot Dog Chili and wanted to design a label that had a classic, old school feeling. Adding vertical pin stripes, gold accents, banners behind the text and a little victorian style ornamentation did the trick! And of course we can’t leave out the Hot Dog Man – a creation of Richard Melito himself!